For us, it is of prime importance that the customer understands the level of quality, the raw materials used, craftsmanship and amount of dedicated work that is invested in each one of our model ships. Our model makers (master craftsmen) are highly talented and dedicated individuals specifically selected and employed by us for their individual skills and craftsmanship. You will have undoubtedly come across many model ship sellers who produce very low-quality ship models. Therefore as the customer, you need to be very careful when choosing a wooden model sailboat. We decided to focus on quality, rather than quantity. We believe in using the best materials, a thorough build process and giving the ship models the highest level of care during this process. All our historic model ships are built from original ships blueprints. Detailed research information collected from various sources such as accurate maritime publications and ships currently in dock around the world is also used for accuracy. Only the finest wood is selected for use on our wooden ship models. Mature Grade-A Teak (Tectona Grandis) is used on all our ship models due to its excellent resistance to environmental exposure and aging. Teak is easily worked and is rich in natural oils which makes the wood suitable for use in exposed locations. The mature teak becomes even more durable when we treat the ship model with oils and varnish. All our ship models are built from scratch. The mature teak wood is cut to the millimeter into fine planks for model ships hull planking and fine blocks for carving. All our ship decorations and deck details are hand carved wood. The model ships hulls are wooden hulls built to last. Frames are cut and shaped according to the ship's blueprints. The wooden frames or bulkheads are mounted on the ship's keel. The wooden frames and keel arrangement is the skeleton of the ship model. All our ship models possess a wooden plank on frame (plank on bulkhead) hull construction. The interior of the ships hull is made up of wooden frames onto which the finely cut planking are pinned. We use small frame spacing to achieve the highest level of accuracy in terms of the shaping of the model ship's hull. This type of plank on frame structure also gives added strength and durability. All the model ships frames are cut using a special tool and each frame is dimensioned as specified on the ship's blueprints. Wood planking sizes are decided based on the level of detail required on each wooden model ship. This is a crucial step in the production of ship models. The first layer of planks is mounted onto the frames. For large sailing model ships and very accurate ship models, the first layer of thin wooden planks is pinned onto each frame. For smaller ships, one single layer consisting of an array of planks is fixed onto the frames. The planks making up the ship's decks are also implemented at this stage. The outer surface of the single planked ship models is then prepared prior to double planking. The outer surface of each ship model is sanded down using coarse to small grain sanding paper. This facilitates the positioning of a second (double) wooden plank layer and the accurate shaping of the ships hull when it is double planked. A second and final layer of planking is applied to the ship model. The thin and narrow planks are very accurately cut and bent according to the local surface curvature where it will be fitted. The secondary planks are neatly mounted or pinned side by side to give a perfect outer surface to the ship models. We carefully check that the double planking is well adapted to the surface. We also make sure that absolute symmetry is achieved during double planking on both sides of the ships hull. The planks on both sides of the bow possess the same inclination and are required to meet the bow structure at the same mirrored point. Again the level of quality is thoroughly maintained during this process. For small model ships, single pinned planking is commonly used while for larger model ships double planking method is used. The type of planking method is dependent on the size and accuracy to be reached. All the decks on our model ships are also built using fine planking. The planks used on that particular component of the model ship is much finer than the planking used on the ship's hull. The stern galleries, figureheads and all decorations are hand-carved into the best wood by our best craftsmen. It requires special skill and attention to carefully replicate the details of sterns and figureheads on a small scale for ship models. All the decorations used on our models are painstakingly hand-made and hand-carved to the best level of quality. All the ships guns/cannons are individually turned and shaped using a lathe. All the guns are made of brass and come in various sizes depending on the scale of the ship models. If necessary, the guns are painted black for better representation. The supports for the guns are all hand-made from wood. All ornaments, decorations, deck details, ladders and gun chariots/supports are made out of wood and varnished prior to mounting on each wooden ship model. A lot of care goes into the addition of deck details. This is a basic aspect where many ship model builders fail to deliver. So you need to pay attention to the number of details and the scale of these details when choosing your ship model. 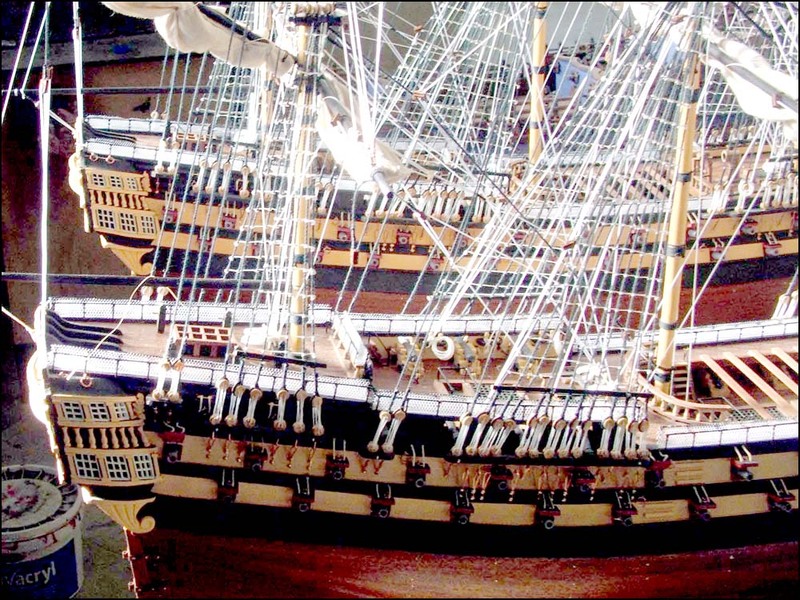 We always endeavour to replicate the details of the ships deck very accurately and to the right scale. It is easier to add more deck details to larger ship models. At this stage, the wooden deck items are finely sanded down and some have a coat of black paint where necessary. The decks are then ready to receive a coat of varnish for presentation. The ship model is then polished using several grades (coarse to thin grained) of sanding paper. This is done in preparation prior to the application of varnish and gives the ship models surface the required polish before varnishing. The first coat of varnish and paint is applied to the planked hull and deck. The model ships are then left to dry in a dust-free environment. The drying process normally takes a couple of days before wooden hand carved pieces can be added to the stern, bow, and deck. The stern, bow and side decorations/details are carefully added. Varnish is carefully applied to each ship model to give the best possible finish and bring out the value and quality of the teak wood used. The mature teak used on the ship model then gains extra protection hence further durability. After the second layer of varnish, the ship model is then ready for preparations for masting and rigging. Channels, shrouds, stays are delicately attached to their respective locations on the ship. The channels shrouds and stays are carefully attached to their respective base locations prior to raising the masts and rigging on the ship model. Rigging base blocks are also allocated their respective threading. At this stage, a final check of the deck details and decorations is performed. At this point during the build, the ship's hull is complete with all its decorations and other details perfectly positioned. The next step is to fix the masts in position onto the model ship. They run through the deck(s) of the model. Following this, the rigging is then set up. Each solid wooden mast is carefully checked for their straightness, length, surface quality and level of detail. The masthead tops/crowsfeet, crosstrees, and tessletrees are constructed according to plans and painted black as it is custom to do so. The ships masts are then varnished before being mounted on the ship models. The masts are assembled and prepared for mounting. Masts are normally assembled painted and varnished before mounting onto the model ships. All our masts are made out of wood to prevent any distortion when the model ages with time. For some models, the masts can be very intricate especially if they possess crow's nests that are very elaborate and require a fair bit of time to construct. Typical examples of these types of masts are those used on the Sovereign of the Seas ship models, the Soleil Royal or even the Wasa. Several thicknesses of rigging are used on our models for a better representation of reality. Different colours of rigging can be used on the ship models. The sails are also mounted during the rigging process. Sails can be mounted in the open or closed positions. All sails are handsewn linen and weathered accordingly. The rigging is set up together with the sails (up or down). The rigging is tight and coated with a special wax for durability and look. The ship models are carefully scrutinized before being put for sale. The ship model is then ready to make its way to you.